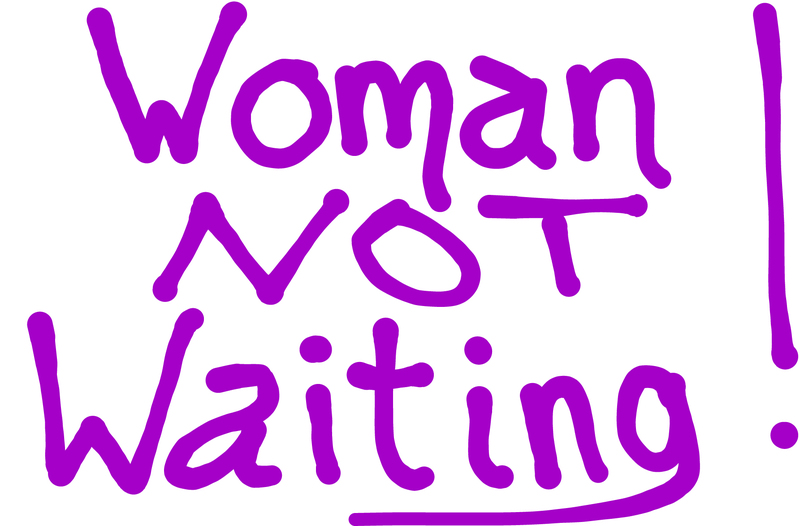 Woman Not Waiting — What are you not waiting for? You are here: Home / Featured / What Are You Not Waiting For? We hung out in pumpkin shells, sat on tuffets, lived in shoes not knowing what to do, waited for dragon slayers, and even perfected sleep-waiting for that all important princely kiss. It was quite acceptable and even expected that we resign ourselves to being trapped in a stone tower pining for our heart’s desire to magically find us (without Google maps) so that we can let down our hair and be set free. Fast forward to the 21st century and you can clearly see that we have put an end to all that nonsense right? Or have we simply become more sophisticated as a waiting species? We now wait for the ding-ding, the ring-ring, or the ping-ping while we wait for the bus, the washroom, or the magnum lacto-ovo Bavarian latte while we wait on that friend again, and again, and again. Yes. You know the one. In fact we create more and more waiting opportunities for ourselves by texting while we wait resulting in waiting for more ping-ping which we desperately hope will lead to waiting for a ring-ring and then waiting for the coveted ding-ding. Romance aside, our addiction runs deeper. On our way home, we make a few stops so we can line up to buy stuff that we really don’t need and since we really are so past waiting (what a waste of time) we chat hands free on the cell phone while we woman-handle the gauntlet of more stuff that we don’t need. Then while we wait for the visa bill, we wait for our raise to go through this time for sure for all our patience waiting for the boss to notice what fantastic work we’ve been doing while we wait for the economy to improve so that we have a chance at waiting for a better position elsewhere to appear. Our biggest wait of all is waiting for scientists and politicians on both sides of the “global warming debate” to stop slinging mud at each other while the planet toasts us (she’ll survive so no worries there, and the mud will turn to beautiful clay cow patties). Insane! but aren’t some things worth waiting for? Absolutely! Waiting for a child as she wobbles towards you with her first steps. Waiting at a door to hold it open for someone. Waiting for a train to pass before crossing the tracks. Waiting for the sun to rise so you can catch the break of dawn. All precious time well spent. …let’s ignore what Simon says from now on. You don’t need anyone’s permission. What am I not waiting for? Not waiting for anyone to approve my life’s purpose before embracing it. Not waiting for the fossil fuel industry to acidify our oceans to the point of mass extinction before weaning myself off them. Not waiting for the community website to be ready for launching before getting a wiggle on it. Thanks for NOT waiting to translate our anxieties about the future of “Gaea” into beautiful prose. Love the serious voice you have given to the threat of our survival . I am hoping to turn a few of the 3-part posts as well into shorts for a wider reach on the not so fiction front. Check out the What-if and the Stories categories. Quite simply, I love it. Love the Ducks are Quacking, love What Are You Not Waiting For. Love your courage. BTW, these pieces are hilarious. And important. Thanks Belinda. I’m glad you had some giggles going. It’s my way of lightening up some serious topics. I’m not waiting to respond to you! There certainly are important posts — and witty and needle me to action! I am loving them! Talk about connecting the dots– you are drawing wonderful pictures and pushing us to act. Glad the humour is keeping you engaged.